Born in Leipzig, Germany, Beckmann studied in Weimar and Paris before establishing himself as an artist in Berlin. During WW1 he volunteered for the medical corps, but was discharged in 1915 after a nervous breakdown. Initially influenced by Impressionism, the horrific experience of the war caused him to adopt a more angular, expressive painting style, mainly focusing on biblical topics and urban themes. 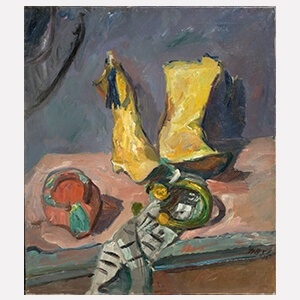 After the war Beckmann resettled in Frankfurt, but with Hitler’s rise to power in 1933, his teaching contract at the Frankfurt art academy was terminated, and he moved back to Berlin. 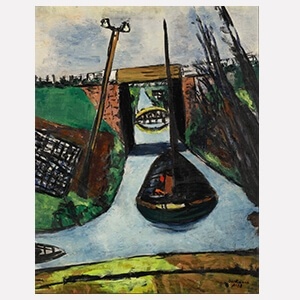 In 1937, after the Nazis removed hundreds of Beckmann’s paintings from public German collections, condemning his art as ‘degenerate’, he decided to leave Germany and immigrated to Amsterdam. After WW2, he settled in the United States where he held teaching positions in St. Louis and New York. Beckmann is especially admired for the intensity of his figurative paintings and unidealized portraits. He is one of the most important German painters of the 20th century.